SEO has strengths where PPC does not, and vice versa. Combining the strengths of each is why the two processes are so powerful when used together. Owing to the fact you can pretty much bid on any search phrase you like with PPC, you are able to test different search phrases to determine which are the most effective for your business.It is more difficult to precisely target search phrases with SEO, so PPC is very useful for making decisions on what the most effective search phrases for your business are, which you can then SEO your web site for. Organic search engine results (left-hand, SEO-induced) get far more clicks from searchers than the PPC text ads (right-hand), owing to where they are on the page. More clicks equals more traffic, customers and profit! Imagine what it is like once the SEO and PPC efforts start to mature and your web site is ranked high on the 1st page of Google with both a natural (left-hand, SEO-induced) search engine result and with a Google AdWords text ad (right-hand, PPC) for the same search phrase! This is quite possible and has been done for many of 1stPageProphets’ own clients. 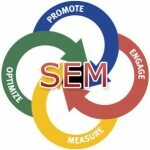 How To: SEM is our section devoted to practical tips and tactics about search marketing in general.